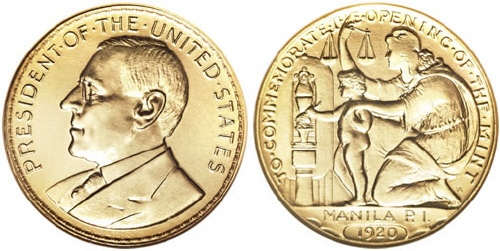 The “so-called” Wilson Dollar was struck to commemorate the July 16, 1920 opening of the Manila Mint, which remains the only U.S. branch mint to ever operate outside of the continental United States. The coin bears the Manila P.I. mint mark. The coin is rare and only three are known to exist, but several so-called silver dollars do exist. Two of the 1920 Wilson, so-called dollars, graded MS62 by NGC sold for $69,000 and $74,750 in 2008 at Heritage Auctions. Their also available in Bronze for about $100. I have seen several bronze types on HA.com and this will be added on the webpage. I debated about adding this one because it wasn't minted in the US, but it's too interesting and mostly unique. And, it was (Is?) a United States Mint. I'm bidding on one in bronze right now, actually. NGC designates this as "Wilson Dollar" Their opinion is good enough for me. It's a neat piece either way. Yes. Your correct, but many coin guides don't include it as a U.S. Comm. But I'm not leaving any out.